Lake of the Woods is one of the most popular destinations for all musky anglers. However, the southern portion of Lake of the Woods is often bypassed for better-known areas. Jim Saric and musky hunters John Mich and Scott Kolpin outline a strategy for fishing this overlooked section of this massive water. No matter where you chase muskies, you need to start the day with a game plan evaluating multiple options and making adjustments based upon the muskies response. Jim Saric, Musky Hunter Managing Editor Steve Heiting, and musky hunter Kevin Schmitt discuss how to develop a game plan on the water, while fishing in the Northwest Angle of Lake of the Woods in Ontario, Canada. Summer musky fishing requires managing your time during the long days and adjusting your tactics based upon the time of day and the conditions. 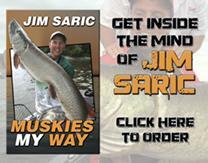 Jim Saric and trophy hunter Tom Sullivan tackle some giant summer muskies while battling big winds. To beat the summer heat, an early morning and late evening approach puts the percentages in your favor for consistently catching muskies. Jim Saric, and pro guide Mike Hulbert fish split-shifts in mid-summer in search of a Lake St. Clair trophy. Cedar Lake in Ontario Canada is a popular summer musky destination. However, when September rolls around, it’s like fishing a new lake, as it is devoid of musky anglers. Jim Saric and musky hunters John Mich and Scott Kolpin feed their Cedar Fever with an early fall trip to Cedar Lake. Balsam Lake is part of the Kawartha Lakes, located 100 miles northeast of Toronto. These waters are loaded with muskies, but Balsam Lake is known for some of the largest fish in the Kawarthas, producing several 50-inch class fish every year. Jim Saric and musky hunters John Cowan and Pete Hoffmann outline tactics for luring trophy muskies on Balsam Lake and the surrounding Kawartha Lakes while dodging summer storms. Timing is everything, particularly in musky fishing. When a feeding window opens and the muskies are biting, it requires specific techniques to catch as many muskies as possible in a short period. On the other hand, when fishing is slow, it requires a different approach to trigger musky strikes from thick cover. Jim Saric and Trophy Hunter Tom Sullivan detail when to utilize various techniques given a particular situation to maximize your results. The Ottawa River, flowing several hundred miles throughout Ontario Canada, is rich in musky fishing lore, and has produced some of the largest muskies on record. Jim Saric and pro guide John Anderson pursue the giants of the Ottawa River, and John provides some interesting historical and biological facts regarding the Ottawa river that explain why it’s called, The Musky Factory. 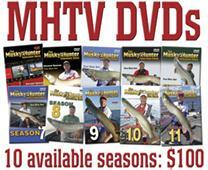 Lake of the Woods legendary guide, Bill Sandy, is a wealth of musky information. Whenever you fish with him, school is in session. His ability to read musky follows, react, and convert strikes is incredible. First, Jim Saric and Bill Sandy reveal some strategies for triggering boatside strikes; then, Jim and Tom Sullivan discuss locating and catching summertime muskies in hot and flat conditions. In late fall, as water temperatures drop, muskies roam edges in search of food. Jim Saric and pro guide Ryan McMahon demonstrate a unique live bait trolling approach for contacting muskies cruising the edge. In northern Wisconsin, casting artificial lures and trailing live bait is a fall tradition. However, success with such an approach relies on a rapid drop in water temperatures to activate muskies and concentrate them along edges. Jim Saric and sucker savant, John Mich, cast jerkbaits and trail suckers in search of a late fall giant.